After many weekends and evenings of construction, the chicken house finally hit livable stage this past Saturday. Happy day for my poor homeless chickens. Of course I had to take pictures, even though it’s not quite “finished”. 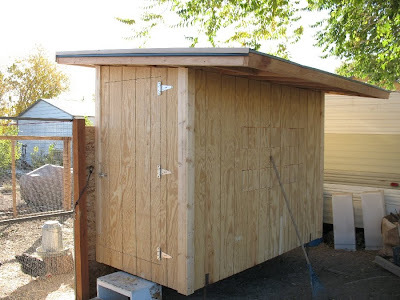 Here’s the back and door side of the coop. It’s built on a 4×8 platform of 2×6’s and wafer board. The walls are framed just like a house (seriously, this thing is built BETTER than our house). They are sheeted with wood that we bought to build our shed, then decided to sheet the shed with metal instead, so these sheets of wood were already bought. 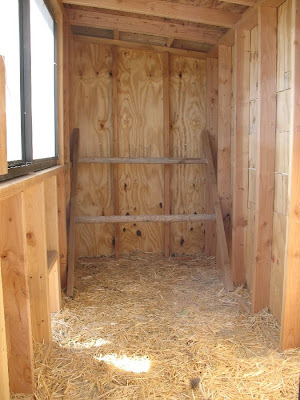 Really, I’m too cheap to have bought the nice stuff specifically for my chicken house, but as it turns out, it looks pretty nice. We don’t have an air compressor powered staple gun for attaching the sheeting so had to screw it on–slow, slow, slow, but it’s done. Trim is 1×4’s. (And no, the rake is not holding the whole thing up!) It is tall enough for me to stand up in, but I’m not very tall. The cut out parts on the back wall are supposed to be nest box access doors, but the nest boxes aren’t built yet, and their design is currently subject to change, so we’ll just see how it all turns out when it gets done. 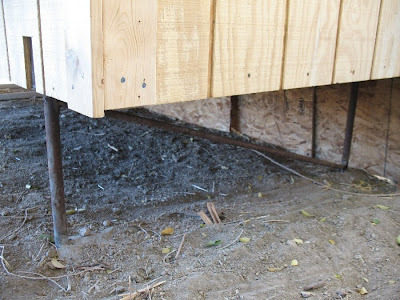 It is raised up about 18 inches off the ground on steel supports and will eventually have the underside fenced in to give the chickens more room to roam. Roof is framed with 2×4’s, sheeted with wafer board, then tar paper and old metal roofing off somebody’s old shed. Here’s the chicken access side. Approx 6 feet tall on the outside. Window was a cast off from another friend whose wife was glad to see it gone from their place. Faces east–should help them warm up nicely on winter mornings. 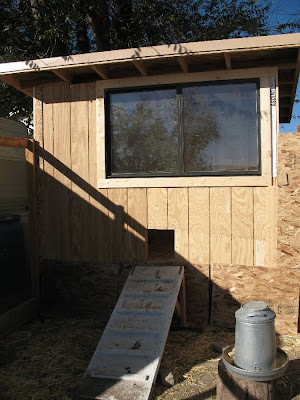 Still need to put the door on the chicken entry, and the underside is boarded up because the fencing isn’t wrapped around the outside of the house yet. The ramp is one we built for the kids to get on the trampoline, but now they’re all big enough to just climb up on it without help, so the chickens get the ramp. Now the inside. Check out the fine framing job. Perfectly square, level, precise, and time consuming. We forgot to account for the overlap at the corners when building the back walls, so we had to scab in a couple extra pieces to catch the edge of the sheeting that didn’t fall on a stud. Things like this are why it takes us so long to build something out of wood. Roosts in the back built by me and our son. Nest boxes are supposed to go on the right wall. Here’s the serious, hurricane proof support structure (okay, we don’t get hurricanes here). Steel pipe sunk in concrete with brackets on top holding the floor platform, and then braced together so they don’t shear off if the wind were ever to get that strong. You can kind of see it all if you look hard. It just looks like 3 pieces of pipe welded together in a squashed “N” shape. I forgot to get a picture of the inside of the door! It’s framed in steel (ahh, steel–it is sooo straight) and sheeted with the same fancy grooved plywood. We still need to get the house painted or stained (that will be my job–hubby doesn’t do paint). I also think a spring closure on the door would be good. We opted for an “out” opening door which gave us more room in the coop to work with, but also means that if the door is not latched the chickens can get out of it and wander around the yard like they did this morning . . . luckily, the neighbors dogs weren’t out and they didn’t go far. They also follow the scrap bucket around, so they all followed me right back into the coop as soon as I had the bucket in hand. And for all this work, we don’t have to buy eggs and get to have constant chicken entertainment. Good trade. Looking good with the coop, my friend! Very nice job. Nothing beats farm fresh eggs…..Just add bacon. Thanks all for the comments, and yes, there are pigs almost ready for the processor :) Yay fresh bacon! Wow, that is some mighty fine construction! You've been busy busy! P.S. Did I tell you we're the new ward activities directors? So wish you were close to take the babies for me and help me figure out stuff to do!